LBM: In Which I Tell a Very Long Tale and Cry. A Lot. Cruising along at 38,000 feet heading to San Francisco to pick up my children and bring them “home”, it might be a good time to finally tell the tale of the last…oh… week or so. Heaven help me, it’s been insane. 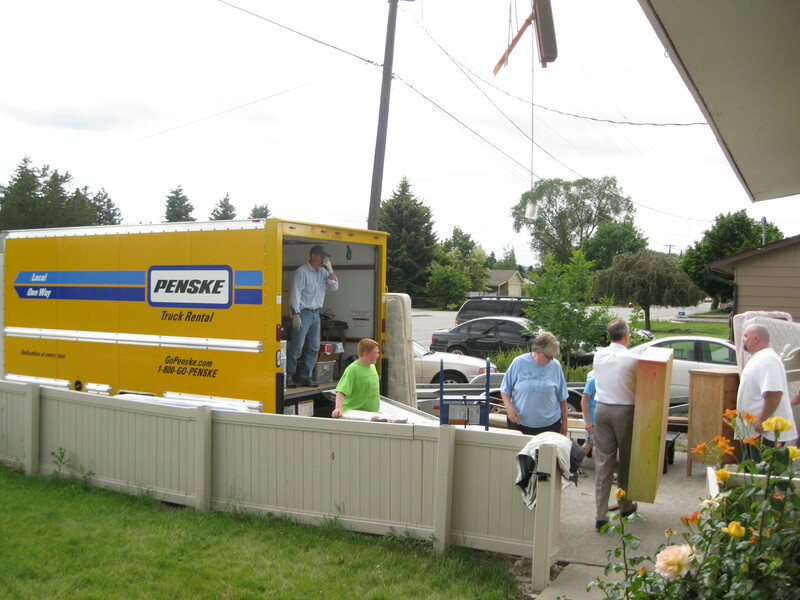 So last Monday, half my ward showed up and loaded all my earthly possessions into a sixteen foot Penske truck. It was wretchedly emotional, as has already been documented, but by Monday night, it was done. The kids and I headed off to spend our last night in Washington state with our good friends, and left the truck and trailer in the driveway of Little House. Tuesday morning before the sun was up, I took my kids to the airport and put them on a flight down to California to stay with family while I dealt with the sure-to-come chaos of actually moving. That wasn’t the original plan, but as Patton said, “The best laid battle plans seldom survive first contact…” Or something like that. Anyway. They flew, for the first time ever, as unaccompanied minors. I would rather pack that moving truck alone three times over than to again put my kids on a plane without me. I’m a pro flyer, but there’s just something about handing your babies over to strangers that is gut-wrenching. Yes, all the safety measures were in place, the lanyards were around the necks, it was a direct non-stop under-two-hours flight… still. I bawled my eyeballs out for a good two hours, until I got the call that their plane had landed and they were safely delivered. Onward. Once the kids were safely having fun with cousins, it was time for me to head back to Little House and load my car onto the trailer. When I got there, my friends were already there— buckets, mops and Mister Clean in hand— and hard at work clearing out the inevitable leftovers and making the place spotless. Tears were had by all. Now, I have some pretty amazing friends- that’s just a longstanding fact. I have tremendous community and support both in real life, and from the online friends via Dandelion, BCC and Facebook. But do you know that not one, but TWO people volunteered to fly across the country and drive my moving truck for me? Yes. So my next job was to go pick up my friend Mark from the airport, where he was flying in from Texas, to drive my moving truck across a continent. It blows me away to even type that sentence. Moving on. Enter chaos. Some professional obligations came up, and Mark’s flight ended up being delayed- his original plan was to have him fly in that Tuesday morning, and to hit the road immediately. But suddenly he was not going to be able to arrive until much later in the afternoon. The problem was, I had a flight to DC that afternoon too. I had arranged to fly ahead of him so I would have two days to paint and putter around, and be ready when he arrived Friday morning. Now I had to figure out how to make my flight (non-refundable, of course) and also find someone to pick Mark up from the airport, transfer all the paperwork, give him the cash from the garage sale (which was the gas money for the truck) and all the keys. All while leaving my truck, trailer, car and every earthy belonging sitting in the driveway of Little House. There was a moment of desperation, I admit. Also, have I mentioned what amazing friends I have? There were several friends who told me not to worry, they had it covered. My last afternoon in Washington was spent having lunch with my one of my dearest friends, before she took me to the airport. In her possession I left every last thing I owned. Including all my money. Tears were had by all. And with that, I flew away. But not very far. I had a stopover and plane change in Denver. Now, I like DIA as far as airports go- it’s well laid out, clean, modern and not full of cavernous wasted space (hello, IAD or IAH). But… an hour is just enough for a stopover. Three hours… not so much— especially when you’re trying to phone the driver of your moving truck to find out what time he gets in and coordinate with people on the ground 1000 miles away. Hours went by… Still I could not get ahold of Mark. Panic was starting to set in- I was worried about him, and I was worried about a plan B, if something had happened, I now needed to consider who/how to get to drive the loaded truck. Should I turn around and go back and do it myself? Waves of helpless frustration and anxiety. As I was boarding my now very-late flight to IAD, Mark called. Relief. He was still en-route, as his meeting took far longer than anticipated, but he’d be in early the next day. Instead of landing at 10 pm in Virginia, my flight touched down at after 1 am. Did I mention trying to coordinate friends from states away? Thank heavens for flexible and willing friends. The next morning, after crashing hard on an air-mattress in my utterly empty townhouse, I got to work painting. And painting. And painting some more. It was kind of therapeutic to be alone and quiet and doing something so simple after the unmitigated chaos of the week. Turns out Mark’s flight got routed all over the country, via IAH, OKC, PHX and finally GEG. He didn’t arrive until nearly 11 the following night. Again, my friends came to the rescue, picked him up, took him to Little House, transferred every needful thing. Mark hammered it and headed east. Yes, at midnight. We’re now two days behind, and I’m trying to keep all the kind folks (most of whom don’t— or didn’t— know me, but who had offered to help) up on the latest intel for arrival and unloading. But I don’t have internet yet in the townhouse. Or a car. Lowe’s is close enough to the new place to walk, which was nice, but I was starting to go stir crazy, and panic a little at my need to let people know what was happening. And Lowe’s doesn’t offer free wifi. And entire afternoon on my cell with Comcast (literally 1 hour 29 mins on hold at one point) finally netted me a technician and an apology for not making the original appointment. It was supposed to be done the day I got there. An apology, mind you, but not a refund of the installation fee. *sigh* There’s only so much fight I have in me some days. Onward. Now wired, I let the kind folks who had offered to help on Friday know that now we were looking at Saturday. Many of them generously moved things in their own lives to make themselves available. Saturday came. And Saturday went. It’s probably a good thing, in retrospect, that Mark forgot his car charger for his phone; that way he missed the 29 times I tried to call. I had no idea where he was or when he would be arriving. And on Saturday evening, I had a houseful of new friends waiting to help unload the truck. But no truck. We all sat on the floor and had Cafe Rio for dinner and got to know each other… but by about 10 pm, folks had to leave. To make a very very long story short, the name of my street also happens to be a town in southern Virginia. GPS doesn’t know the difference, apparently, and there was a 300 miles detour. At close to midnight, I was standing out in the middle of my street, literally jumping for joy and crying with relief when Mark pulled the giant dinosaur of a truck up in front of my house. Tears were shed by all. Oh yeah… it’s midnight. Crap. Now what? We managed to offload my car, dump the trailer at the Marriott around the corner and unload over half the truck before sheer exhaustion won out. I don’t even know what time it was. Sunday morning, I threw a bat-signal onto Facebook and asked if anyone in the NoVA area felt like getting the ox out of the mire. People showed up. One man, whom I had never met before but who is also a part of an online Mormon board, drove to the chapel, spoke to the bishop (who already knew who I was) and returned with two Missionaries plucked straight from Sacrament meeting. It was one of the most lovely examples of the beauty of our community I could have imagined. The truck was unloaded in short order. The Elders were returned to church. And Sunday carried on. Never, through all of this, was there not some friend— whether old and well established, or brand new— waiting with open arms. Say what you might about our peculiarities, but there are some things we do as a people that when we get right, we get really really right. There are simply no words, yet again, for me to thank or express my love and humility at the service provided for me and my children. I am SO READY to be on the giving end. I’ve got a direction book and a set of blueprints on how to do it right, and I can’t wait to open that sucker up and get to work. So now, I’m on a flight to San Francisco, due to land in about three hours, where I will see some family and friends, pick up my overjoyed kiddos, and take them home. Tears will be had by all, I have no doubt. Thank you, one and all- in whatever manner you supported and loved us- be it with your muscles, sweat, time, food, cleaning supplies, hugs, or prayers. It was felt. You are loved back. First of all, there is SO flipping much to tell. This has been an adventure of crazy high order, including missing days lost to the St Louis Triangle (you thought Bermuda had the monopoly on triangles? nope. ), the normal lost hardware for bed assembly, missing drivers, dead cellphones causing unmitigated panic, moving parties turning into “Oh well, no truck, let’s go to Cafe Rio” parties, strangers showing up to save the day, pulling Elders out of Sacrament meeting to move a piano, and an overheard comment “Educated Mormons are the worst. 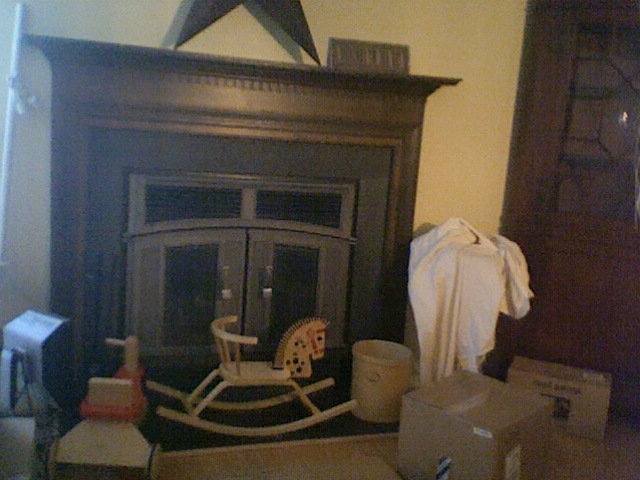 Not only do they always have a piano, but they have boxes and boxes of books, too.” Awww yeah. I promise a more fleshed out story later with all the details and amazing people who have kept me from chewing off my foot in stress over the last four days. 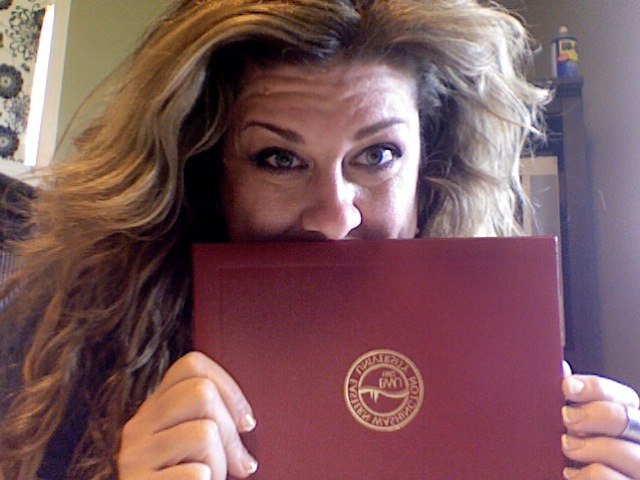 But for now, I have boxes and boxes and boxes to go through, and I have to jump a flight to go pick my kids up. Where my camera is, I have no idea, so this morning, I walked around the house snapping pics with my mac. It’s a little dark, but better than nothing. 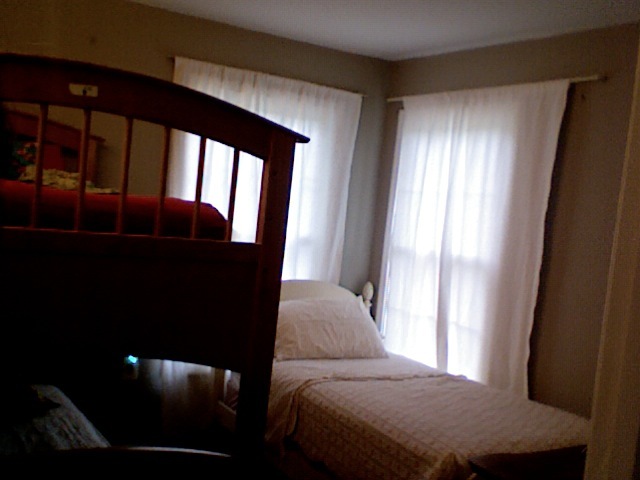 This is the kids’ room. Yes, all three will be in one room, but they’re excited about it. This room was teal green. DARK teal green. It’s now a color call pewter, but I told Bean it’s called “Robot” and he’s all excited. Score one for Mama. 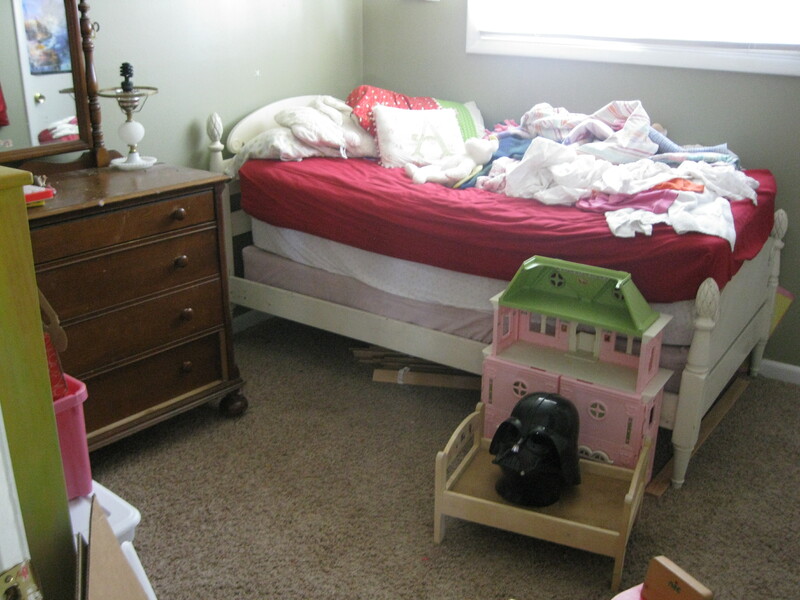 All three kids in here allows the bedroom to be for sleeping, and the other room to be where toys, games and Lego chaos happens. At least that’s what I’m telling myself. 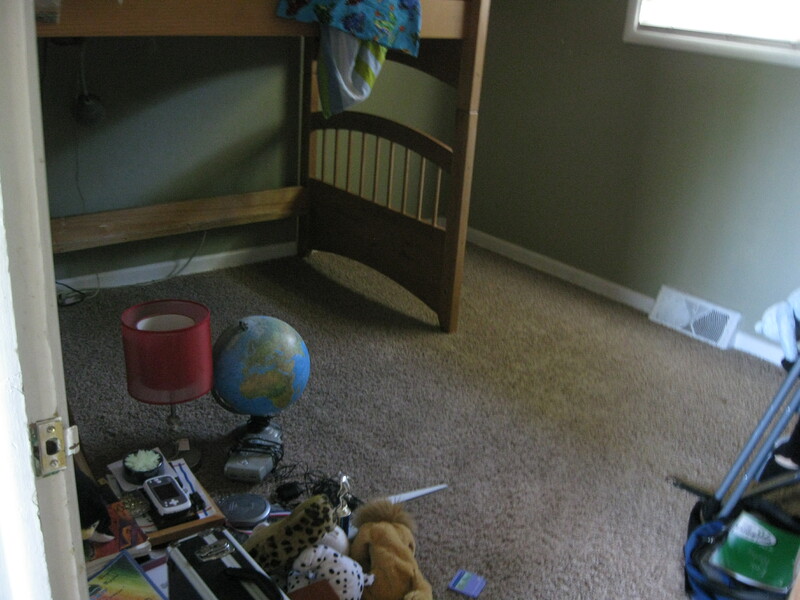 When I got here, this room was aqua. Not blue… AQUA, like 1966 Pooltime Barbie AQUA. It’s now a nice somber Taupe. Take that cheery bright color. I bring gloom from the Pacific Northwest to your Virginia humidity! 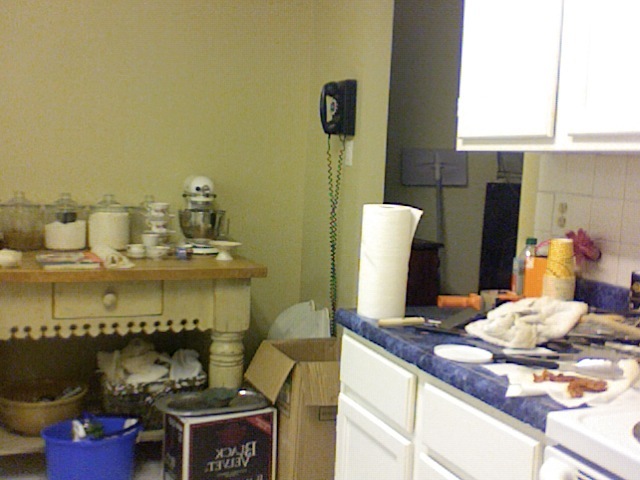 Here’s the kitchen. All you need to notice is the bacon on the counter. I may now know where the camera is, but I found my cast iron skillet. The kitchen was also sky blue. Please ignore the blue counter tops. I plan on it. With all my might. The bathrooms are still bright bruised purple. My camera started to cry when I tried to take a picture, so you’re gonna have to take my word for it. My bedroom was also that same shade of grape, but is now Montpelier Grey. 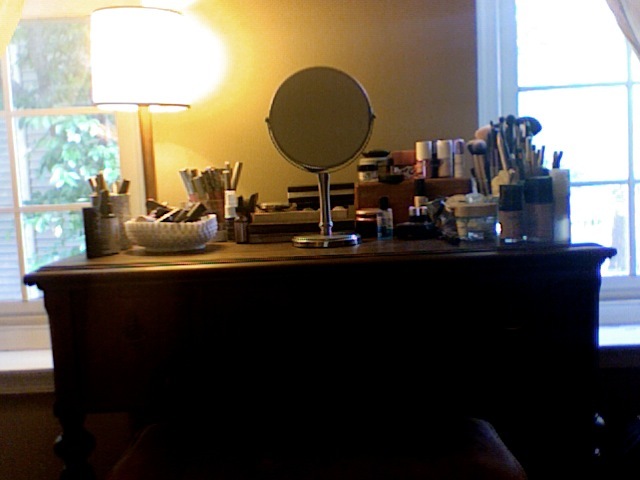 And as you can see, while the rest of the house might be in abject chaos, I have my priorities in order: the make-up table is unpacked and looking lovely. Priorities, my lovelies, priorities. So. This was what started, around three this afternoon. My ex-husband showed up and drove the truck for me to the house, and then friends started pouring in to offer their help. It started to rain, but hey, what did I expect? 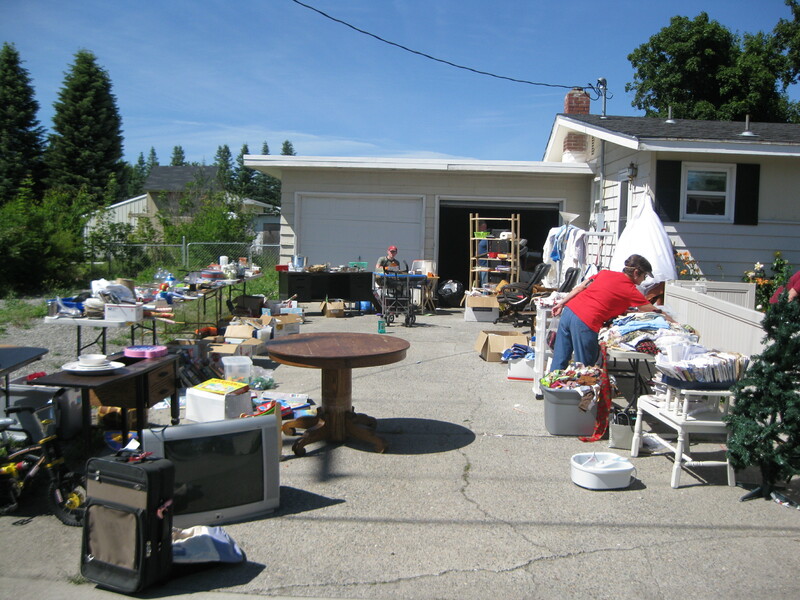 The truck filled up waaaay faster than believable, and I was tearfully trying to cull things in the driveway on what was “have to keep” and “will let go”- so much so that the neighbor had even opened her garage and they were moving things to store. 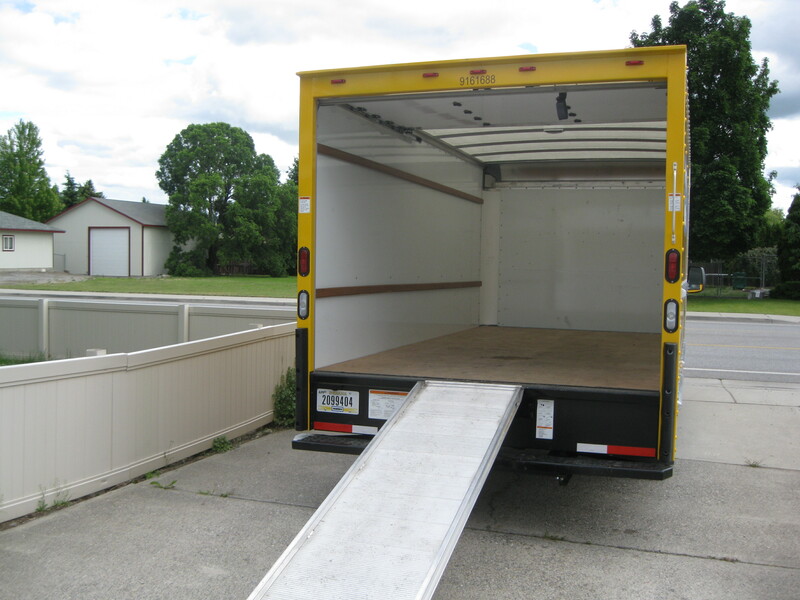 It’s only a 16′ truck, but my some miracle, a three bedroom house fit. I’m calling it the Tardis Truck. What you’re looking at here is the best Home Teacher on the planet, front and center, and the most amazing group of friends who have loved and supported me and my kids. I get emails from so many kind people telling me how they are cheering me on and supporting us from afar— these are the hands who have held us up with the grace of your prayers. Tomorrow we roll. Stay tuned. Thank you for loving us from afar. Her eyes stung and she blinked hard, trying to clear the heavy haze from too much crying. Sadness draped her frame and cloaked her face, as she leaned wearily against the back of her bedroom door. She had known this week was going to be rough, but as so often happens, theory and planning fall like dry tinder before the raging fire of a lived life. It all looked so simple from months away, but now the heat and pressure were making it hard to breathe. Was it just yesterday that she had graduated? College graduation is supposed to be a big deal, she had presumed. For the blood, tears, stress and debt it incurred, it really should be- and yet, hers was not. She kept telling herself it was okay, that it really didn’t matter- and she knew that was true. Mostly. But her eyes still stung thinking about hearing her name called to silence. It didn’t matter. Graduation was just an addendum to an already overflowing week, capped by two solid days of offloading her and her children’s personal belongings. 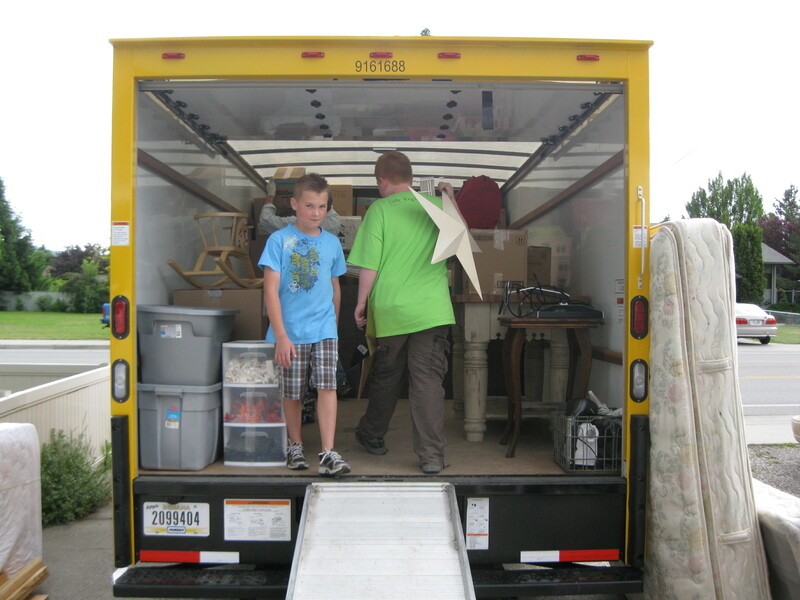 The plan was, two days after graduation, the moving truck would be there and she had to downsize by half. The sunburned cheeks of her friends at church that morning had given tell to whom had spent the weekend in her yard. Tears sprung to her eyes again. Gratitude. Shame for missing the cheers. Humility for feeling undeserving of an outpouring of love from so many friends. The kids were starting to peck at each other, and her daughter called through wondering about dinner. There was a phone ringing, but she wasn’t going to try and find it. Let the machine get it. It could join the twenty-eight other messages never to be listened to. The kids’ father was coming by to take them to Chuck E Cheese for dinner with their Nana. She had forgotten it was also Father’s Day. Fortuitous, since they were now out of paper plates and bowls, and she didn’t have a clue what she could throw together from the cupboard leavings. Everyone was tired of frozen or fast food. Flopping on her stomach on the soft bed, she thought she would just close her eyes for a moment. Her daughter was now out in the yard calling for the neighbor’s cat. The next two days yawned before her and she wished with fervent exhaustion for a pass on this one. Nope. Truck comes tomorrow at noon. She closed her eyes, and the relief brought a fresh welling of hot stinging tears. So tired. She tried to only think about the next five minutes, most of which she wished for sleep. She’d lived in this little house for two and a half years, and in her neighborhood for just over ten years. Two of her three babies had been born there, and some of the most amazing people called her their friend. Yet she was packing up and leaving. Why? Why couldn’t she just stay? Every time she contemplated it, her gut locked up, and she’d feel sick. She didn’t know why she had to go, but she knew it was time, and if she tried to force it, things here would start to unravel. It was just the way it worked. As frightening as it was, the idea of not listening to whispers to her spirit telling her it was time to fly- was far more terrifying. So there she flopped. Exhausted beyond all imagined reason, but hearing her kids’ father pull into the drive and the familiar knock on the door. She rubbed her eyes and sat up as she listened to the kids shriek with happiness that cheap pizza and skeeball were in their immediate future. The backdoor rang, and she realized she had forgotten the people who bought the washer and dryer were picking up, and she headed downstairs to pull the last load of laundry from the dryer. 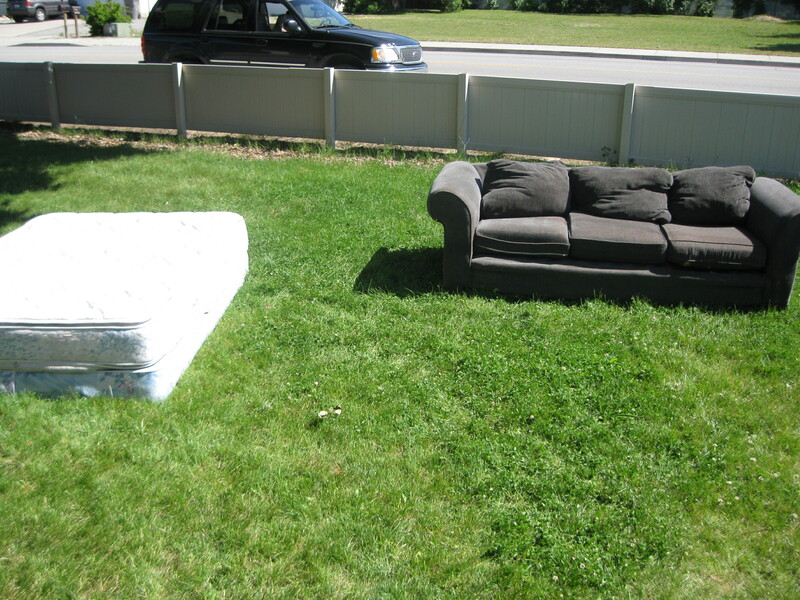 As a testament to her exhaustion, she noticed there was a couch on her front lawn still from the weekend. She stood at the window, arms full of warm dry laundry, and idly wondered what would happen to it. She had been sitting on that brand-new couch nursing her oldest son when the first plane hit the tower nearly eleven years ago. Now, it was a yard decoration. And she just didn’t care. I keep walking out thinking nothing much has changed… then I compare to earlier pics from this morning. 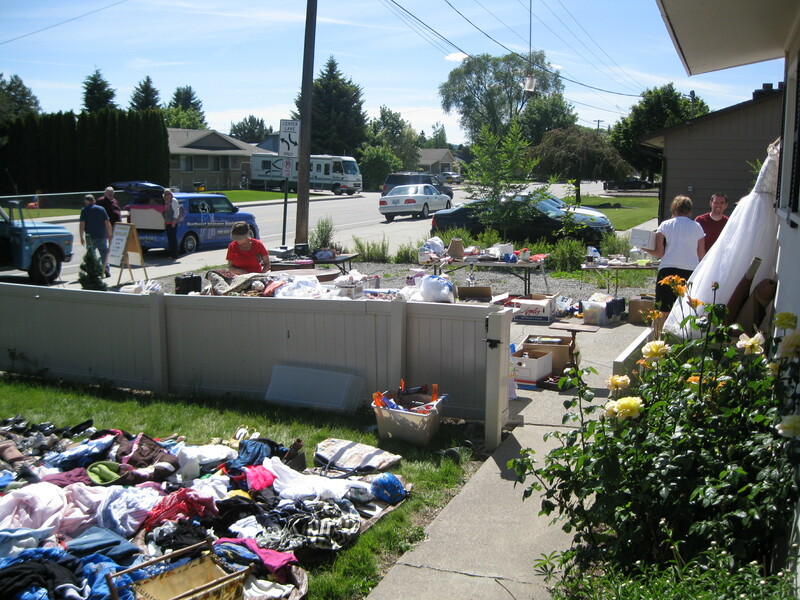 And yeah, we’ve sold a ton of crap- I mean, Good stuff! How am I ever going to survive in Virginia without these amazing people in my life? I’m starting to get very very teary when I think about what I’m leaving behind.